Gauldur is interred in Reachwater Rock. 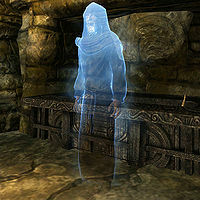 You will encounter Gauldur's spirit there as part of the related quest, where he will aid you in defeating the ghosts of his three sons and reforge the Gauldur Amulet. This page was last modified on 20 January 2014, at 23:52.